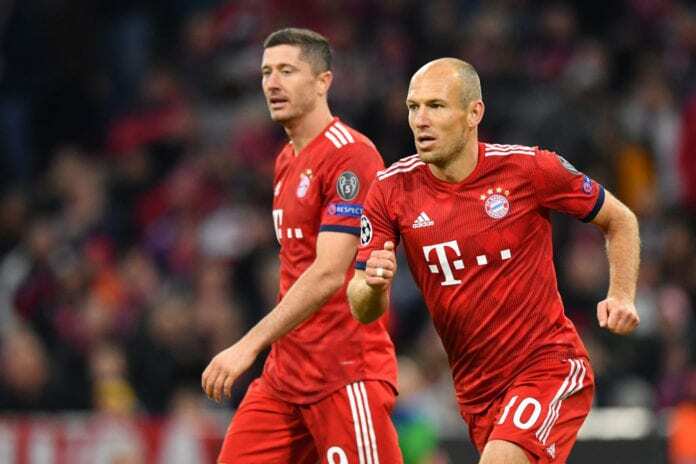 Robert Lewandowski and Arjen Robben warned Bayern Munich they will have to retain 100% concentration to stand any chance of beating Liverpool in the Champions League. The Bundesliga champions have been drawn to face Liverpool in the last-16 stage of the competition next month. Following last season’s Champions League final appearance though, Liverpool have strengthed since then by making a number of key signings in last summer’s transfer window. Due to this, Jurgen Klopp’s side lead the Premier League after 23 games with a four-point advantage over reigning champions Manchester City and reached the knockout stages of the Champions League from a group that contained Paris Saint-Germain and Napoli. Therefore, Lewandowski will be keeping tabs on Liverpool over the next month. “I think we played very well in the groups,” said Lewandowski, according to Fox Sports. “Of course now we have very difficult opponents in Liverpool. “At this moment they are top in the Premier League, we still have a few weeks, and I think what will be very important is how we feel one week before the game. “If we are ready, we are fit, then we are fighting and I hope we get through to the next round and of course this is our dream to beat Liverpool. And former Chelsea star Robben warned Bayern that they have to be on top form to stand a chance of overcoming Liverpool at Anfield. “It’s clear it’s going to be a difficult one and also very interesting,” he said. “To play at Anfield is a very nice challenge, we should take it that way as well, in a positive way, going there with a lot of confidence. The first leg between Liverpool and Bayern will take place at Anfield on February 19 with the return leg at the Allianz Area set for March 13.